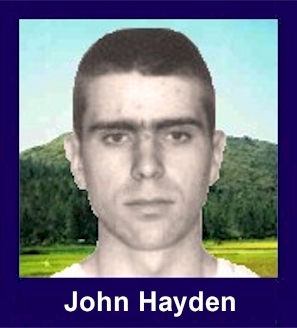 The 35th Infantry Regiment Association salutes our fallen brother, SP4 John Loren Hayden, who died in the service of his country on January 20th, 1967 in Binh Dinh Province, Vietnam. The cause of death was listed as Small Arms/AW. At the time of his death John was 21 years of age. He was from Los Angeles, California. John is honored on the Vietnam Veterans Memorial at Panel 14E, Line 57. The decorations earned by SP4 John Loren Hayden include: the Combat Infantryman Badge, the Bronze Star with V, the Purple Heart, the National Defense Service Medal, the Vietnam Service Medal, the Vietnam Campaign Medal and the Vietnam Cross of Gallantry with Palm Unit Citation. John's Bronze Star with V citation. For heroism in connection with military operations against a hostile force. Specialist Hayden distinguished himself by heroic actions on 20 January 1967, while serving as Squad Leader of the Reconnaissance Platoon of the 1st Battalion, 35th Infantry, on a search and destroy mission in Binh Dinh Province. The unit was moving up a heavily vegetated hill when it was fired on by an estimated reinforced North Vietnamese squad in fortified positions. Reacting immediately, Specialist Hayden quickly brought his squad into assault position and unhesitatingly moved forward, aggressively leading the advance. As he moved, shouting orders and encouragement to his men, he displayed such inspiring self-assurance and personal bravery that the momentum of the assault continued and succeeded even after Specialist Hayden had received a mortal wound, His forceful action was instrumental in the platoon's seizing of the objective with a minimum of casualties. Specialist Hayden's outstanding display of aggressiveness, devotion to duty and personal bravery is in keeping with the highest traditions of the military service and reflects great credit upon himself, his unit, and the United States Army.